During his last illness, Abu Bakr had conferred with his people, particularly the more eminent among them. After this meeting, they chose ‘Umar as his successor. ‘Umar was born into a respected Quraish family thirteen years after the birth of Muhammad (peace be on him). Umar’s family was known for its extensive knowledge of genealogy. When he grew up, ‘Umar was proficient in this branch of knowledge as well as in swordsmanship, wrestling and the art of speaking. He also learned to read and write while still a child, a very rare thing in Mecca at that time. ‘Umar earned his living as a merchant. His trade took him to many foreign lands and he met all kinds of people. This experience gave him an insight into the affairs and problems of men. ‘Umar’s personality was dynamic, self-assertive, frank and straightforward. He always spoke whatever was in his mind even if it displeased others. ‘Umar was twenty-seven when the Prophet (peace be upon him) proclaimed his mission. The ideas Muhammad was preaching enraged him as much as they did the other notables of Mecca. He was just as bitter against anyone accepting Islam as others among the Quraish. When his slave-girl accepted Islam he beat her until he himself was exhausted and told her, “I have stopped because I am tired, not out of pity for you.” The story of his embracing Islam is an interesting one. One day, full of anger against the Prophet, he drew his sword and set out to kill him. A friend met him on the way. When ‘Umar told him what he planned to do, his friend informed him that ‘Umar’s own sister, Fatima, and her husband had also accepted Islam. ‘Umar went straight to his sister’s house where he found her reading from pages of the Qur’an. He fell upon her and beat her mercilessly. 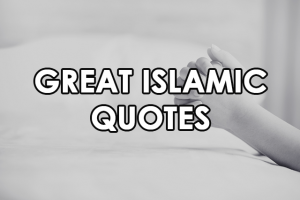 Bruised and bleeding, she told her brother, “Umar, you can do what you like, but you cannot turn our hearts away from Islam.” These words produced a strange effect upon ‘Umar. What was this faith that made even weak women so strong of heart? He asked his sister to show him what she had been reading; he was at once moved to the core by the words of the Qur’an and immediately grasped their truth. He went straight to the house where the Prophet was staying and vowed allegiance to him. Umar made no secret of his acceptance of Islam. He gathered the Muslims and offered prayers at the Ka’aba. This boldness and devotion of an influential citizen of Mecca raised the morale of the small community of Muslims. Nonetheless ‘Umar was also subjected to privations, and when permission for emigration to Medina came, he also left Mecca. The soundness of ‘Umar’s judgment, his devotion to the Prophet (peace be on him), his outspokenness and uprightness won for him a trust and confidence from the Prophet which was second only to that given to Abu Bakr.The Prophet gave him the title ‘Farooq’ which means the ‘Separator of Truth from the False hood.’ During the Caliphate of Abu Bakr, ‘Umar was his closest assistant and adviser. When Abu Bakr died, all the people of Medina swore allegiance to ‘Umar, and on 23 Jamadi-al-Akhir, 13 A.H., he was proclaimed Caliph. He insisted that his appointed governors live simple lives, keep no guard at their doors and be accessible to the people at all times, and he himself set the example for them. Many times foreign envoys and messengers sent to him by his generals found him resting under a palm tree or praying in the mosque among the people, and it was difficult for them to distinguish which man was the Caliph. ‘Umar gave his government an administrative structure. Departments of Treasury, army and public revenues were established. Regular salaries were set up for soldiers. A population census was held. Elaborate land surveys were conducted to assess equitable taxes. New cities were founded. The areas which came under his rule were divided into provinces and governors were appointed. New roads were laid, canals were lug and wayside hotels were built. ‘Umar died in the first week of Muharram, 24 A.H., and was buried by the side of the Holy Prophet (peace be upon him).